Cruising along the meandering ‘vecht’is recommented. You will pass nice little towns, beautiful old country-estates from our Golden Age, tea cottages along the banks and old wooden drawbridges. 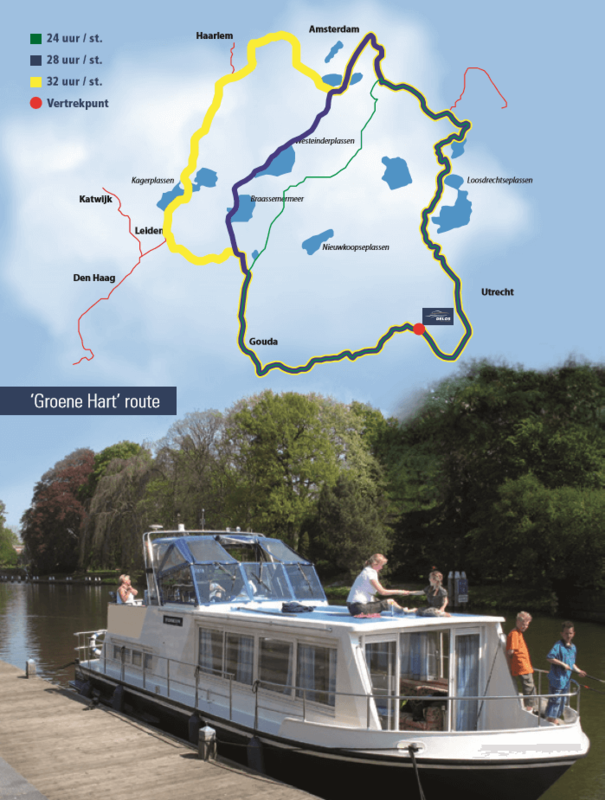 Visit Weesp, Loenen, Nigtevegt, Breukelen and Muiden! One of the busiest boating centers of Holland. The Loosdrechtse lakes consist of 7 lakes, where you’ll find playgrounds,beaches. Barbeque grills,but also many marina’s, teagardens and restaurants along the banks. The nightlife here compares with Amsterdam, never a dull moment in Loosdrecht. The hollandse ijssel has two faces, between Gouda an Rotterdam it is a very busy commercial waterway. And between Gouda and Nieuwegein it is a lovely small river.You will pass dreamy towns like Ijsselstein ,Gouda, Oudewater(witchweighhouse) and Montfoort. The Kager Lakes are amidst beautiful polderlandscapes with old windmills and picturesque Villages. The world famous Keukenhof, where an abundance of flowers welcome you Every year, is not far away from here. Do not forget to visit nearby Leiden, a historic city With a romantic centre, worth seeing. Right next to Aalsmeer the Westeinder Lakes are dreaming away, surrounded by lush Meadows and polders. A place to rest and enjoy the breathtaking views and beauty of Undisturbed nature.